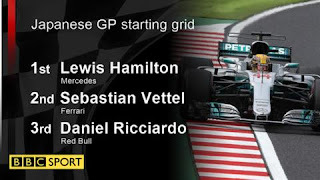 Lewis Hamilton beat his title rival Sebastian Vettel in qualifying at the Japanese Grand Prix to take his 10th pole in 16 races this season. Hamilton was 0.332 seconds quicker than Mercedes team-mate Valtteri Bottas after two almost-perfect laps. Ferrari's Vettel was 0.472secs off the pace but will start alongside Hamilton on the front row because Bottas received a five-place grid penalty for a gearbox change. Hamilton and Vettel will be battling on their own as the German's team-mate Kimi Raikkonen also drops down the grid after a penalty.